In an effort to examine the broader impact of mobile devices on people’s lives, we presented cell phone owners with six separate impacts that might result from mobile phone ownership and these impacts were equally balanced between positive and negative ones. These responses indicate that mobile users see mostly positive benefits to mobile technologies — but also some drawbacks related to the constant connectivity (and mental temptations) that cell phones offer. When it comes to the positive impacts of cell phone ownership, fully two-thirds (65%) of cell owners say that mobile phones have made it “a lot” easier to stay in touch with the people they care about, while just 6% say that their phone has not improved their connections with friends and family at all. Roughly half of cell owners say that their phone has made it at least somewhat easier to plan and schedule their daily routine, and to be productive while doing things like sitting in traffic or waiting in line. When it comes to the “dark side” of cell phone ownership, roughly one in five cell owners say that their phone has made it at least somewhat harder to forget about work at home or on the weekends; to give people their undivided attention; or to focus on a single task without being distracted. 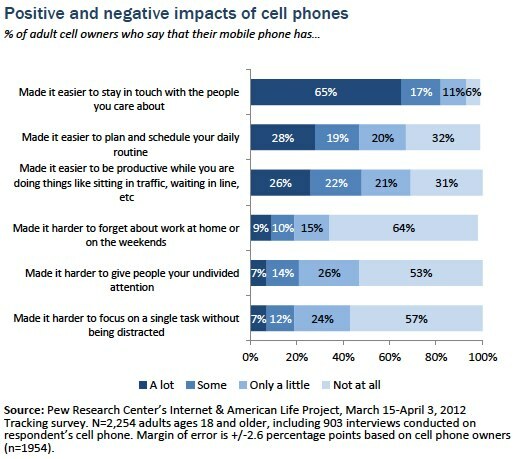 A majority of cell owners say that their phone has had no impact at all on their life in any of these negative ways. 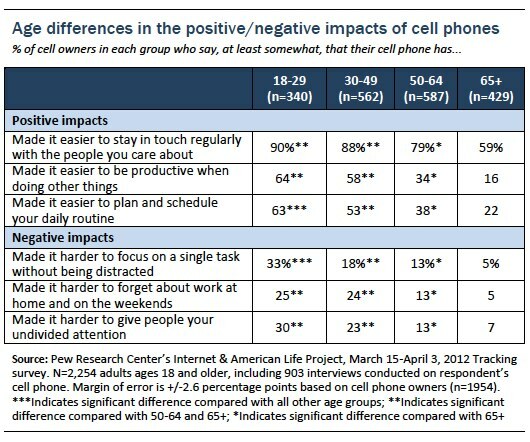 Compared with their elders, younger cell owners are especially attuned to both the positive and negative impacts of mobile connectivity. Low- and high-income cell owners also have divergent attitudes towards the benefits and challenges posed by ubiquitous mobility. Those from higher income households are more likely to say that their cell phone makes it easier to schedule their daily routine, and to be productive throughout the day. At the same time, cell owners with a household income of more than $75,000 per year are significantly more likely than other cell owners to say that their phone makes it harder to disconnect from the demands of the workplace. Some 17% of these high-income earners say that their phone makes it “a lot” harder to do this (compared with 7% for those earning less than $30,000 per year, 6% for those earning $30,000-$49,999, and 8% for those earning $50,000-$74,999). Overall, nearly one third (29%) of high-income cell owners say that their phone makes it at least somewhat harder to disconnect from work at home and on the weekends. One third of cell owners say that overall, their cell phone saves them time — while just 3% say it costs them time. Overall, cell owners are far more likely to view their phone as a time-saver than as a time-waster. Some 33% of cell owners agree with the statement that their phone “saves you time because you can always access the information you need,” while just 3% agree with the statement that their phone “costs you time because you are constantly distracted or interrupted.” The largest proportion of cell owners (56%) say that the time costs and time savings offered by cell phones pretty much balance each other out. Smartphone owners have especially positive attitudes towards their phones’ time-saving capabilities. Some 44% of smartphone owners say that their phone saves them time because they can access the information they need at all times—double the 20% of non-smartphone owners who say the same. And despite saying that their cell phone makes it hard to escape the demands of employment, cell owners with high levels of income and education are generally quite positive about the time-saving capabilities of their mobile devices. Some 42% of cell owners with a college degree (and 43% of those with an annual household income of $75,000 or more) say that their cell phone saves them time overall, a significantly higher percentage than those with lower levels of income or education.